Nicola is an experienced Project Manager in InnoTech with specific responsibilities for managing the overall coordination, financial and administrative aspects of project delivery. 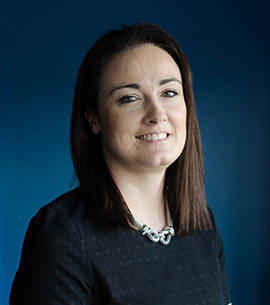 Within the last five years Nicola has been the Project Manager for a number of business innovation and upskilling programmes including The InnovateUs Programme and Skills Focus Programme funded by the Department for the Economy. The InnovateUs Programme has supported over 300 businesses offering flexible, client-led innovation support to help the companies identify and develop new products or services. As project manager, Nicola was responsible for the implementation of the programmes marketing and recruitment strategy to ensure the recruitment targets were achieved. Nicola was responsible for developing and executing a management plan for the projects, coordinating the project delivery team, maintaining the Projects CRM system and monitoring the progress against deliverables, sustaining communications with participating businesses and the project funder and handling the project budget, claims and progress reports. Previously she has also project managed three Council led programmes, on behalf of the College, covering a diverse range of topics including Product Development, innovation support, and resource efficiency. These activities involved the development of working relationships with industry to identify and carry out relevant projects through the utilisation of skills held within the FE sector to assist product development, process improvement, improving resource efficiency and energy management.